This topic contains 84 replies, has 11 voices, and was last updated by HammerHead 2 months, 1 week ago. Following its recent run-out edition Golf, Volkswagen has announced a series of tweaks to the line-up of the Tiguan SUV, including a new 227bhp petrol engine and a value-added Match model. This new trim level replaces the Tiguan SE and SE Nav models, offering more standard equipment at a reduced cost, with prices starting at £26,750. The new base-model builds on the specification of the Tiguan SE Nav, adding a rear-view camera, parking assist, keyless entry and 19-inch alloy wheels. Other standard features include an eight-inch touchscreen with DAB radio and sat-nav, lane-keeping assist and a collision warning system. Volkswagen will also replace the Tiguan’s range-topping R-Line trim level with a new R-Line Tech model. Prices start at £33,150 and, like the Match edition, it offers more standard equipment for less money, adding park assist, keyless entry, a 360-degree camera and a fully-electric tailgate to the outgoing R-Line Tiguan. In addition, VW now offers the Tiguan with a 2.0-litre turbocharged petrol engine with 227bhp and 350Nm of torque, borrowed from the current Golf GTI. 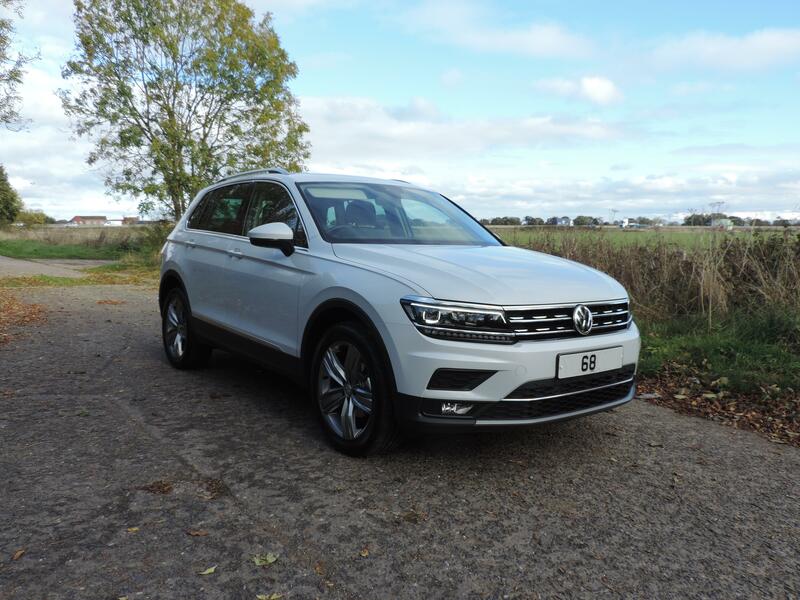 It feeds its power to all four wheels through a seven-speed DSG, giving the Tiguan a 0-62mph time of 6.3 seconds and a top speed of 142mph. Available in both Match and R-Line Tech models, prices will start at £38,335. The new engine and trim-levels are expected to hit showrooms later this month and will be available for both the standard Tiguan and the Tiguan Allspace 7-seater. So these will be available on motability? That’s more like it. I wonder if we’ll still be gouged on the AP even though the prices have dropped. Anything over 200bhp will not be available. So forget about it. We disabled can’t be trusted with such power! The 227bhp is an engine option though, so Match trim is still available without the 227Bhp engine? BHP seems such an arbitrary decision by insurance companies. My car is 231 bhp and is all the safer for it. I can pull away at traffic islands and junctions with total confidence, and yet never feel the need to break speed limits. I have a ‘heads up’ display which gives me my current speed alongside the speed limit, and it’s a fact that even with 231 bhp on tap I am safer because of my car’s abilities. Insurance decisions should be made on much broader issues than engine power. i have had an email from motability this morning saying they have agreed with VW to add the updated Tiguan models (match and R-Line Tech) and expect them to be available on the scheme by the end of January. Ad1 even though I posted this thread, I am not the biggest Tiguan fan. One of the main problems with the scheme is that frequently you have to compromise with regard to your car choice. So I look forward to seeing the AP for two models you have mentioned and, assuming there are no major problems with the APs, I will have a visit to my local dealer and have a look. It’s a shame that we’ve lossed the SEL model as that was the ideal one for me. So now it’s between the Match or the R-Line. The match has only Halogen Headlamps and no Active Info Display or Pan Roof – which is a shame as they are extras now. So even if the AP comes down by £300 it will cost £2000 or more to bring it in line with the Outgoing SEL spec methinks. It seems to me, that motability will know just now which spec will be going on the scheme. I wonder if wmc can get any further info. I, ideally, would have wanted an EV and I went to see the kia e Nero with a view to purchasing it out with the scheme, but it was too small for us. The way things are going I can’t see a usable EV on the scheme anytime soon, so I am reluctantly on the lookout for a largish diesel SUV and this could be the one. The SEL is still on the list in both manual and auto. The SEL is still going to be produced. I would have thought Motability will keep it on the list. The only Tiguans no longer available for factory order is the SE, SE Nav and the R-Line. I am interested in the SEL for my next 3 year motability lease, though from what my dealer says it’s unlikely I will be able to test drive one because there are none around. Winston – Out of interest why wouldn’t you be interested in one? I ordered my SEL back in July and when I ordered mine there was not a test car available at all. I ended up test driving my own car as it arrived late September and I took delivery of it late October. That’s great, how are you finding the car? I absolutely love it. It is everything I want out of a car. I went for the 2.0TDi 150, 4Motion, DSG and it is a loverly smooth car. It still has its appeal that when you go out you don’t want to stop driving it. The colour of mine is no longer available so I am quite lucky to get it. It looks different in different light conditions. If anyone is interested I can recommend JCT 600 in Hull and you’ll get £500 off the AP. Thanks Winston – problem is the R currently isn’t on the scheme. SEL as far as I can see is the nicest one, for the higher bhp I want. Okay I probably will be ordering around early March, I still haven’t been able to drive any of the cars I am interested in yet, dealers just don’t have them in. So if it does appear before then I will bear in mind.